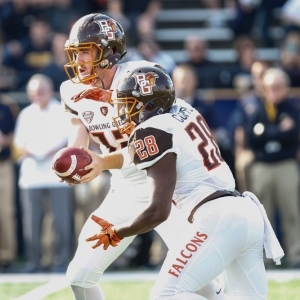 The Bowling Green Falcons head to UB Stadium to play the Buffalo Bulls on Tuesday, November 7, 2017. The opening line for this matchup has Buffalo as 12 point favorites. The Falcons are 2-7-0 against the spread and their over/under record is 4-5-0. The Bulls are 7-2-0 against the spread and their over/under mark is 3-6-0. 11/05/17 LB Armani Posey Undisclosed is "?" 11/05/17 OL Clark Clancy Undisclosed is "?" 11/05/17 OL Tim McAuliffe Undisclosed is "?" 11/05/17 DL Malik Brown Disciplinary is "?" 11/05/17 DL Shannon Smith Disciplinary is "?" The Bowling Green Falcons are 103rd in the country in points scored with 208. They have run 642 plays this year for 3,414 yards, which ranks them 77th in Division 1 in total offense. The Falcons average 5.3 yards per play, which is 93rd in the nation. As a team they have accumulated a total of 168 1st downs this season, ranking them 102nd overall as an offensive unit. On the ground Bowling Green has run for 1,453 yards as a unit, which ranks 66th in college football. They've run 334 times, averaging 4.4 yards per rush as a unit. The Falcons have been penalized on offense 66 times for 593 yards so far this year, which has them 26th in the country in penalties. James Morgan has passed for 1,260 yards this year. He's completed 96 throws while attempting 212 passes for a completion percentage of 45.3%. His quarterback rating this season is 102.6. He averages 5.3 adjusted yards per throw and 5.9 yards per pass attempt. Bowling Green is 112th in the country in points surrendered on defense with 318. They have given up a total of 4,496 yards on D, which is 123rd in D-1. The Falcons are 116th in yards per play allowed with 6.5. Opponent offenses have completed 171 throws on 292 attempts against the Bowling Green Falcons defense this season, ranking them 76th and 85th in the nation. The Bowling Green pass defense has also surrendered a total of 2,262 yards in the air, which is 94th overall in total pass defense. Their rushing defense has given up 398 attempts for 2,234 yards this season, putting them in 124th place in the country against the run. The Falcons have had 47 penalties for 376 yards on defense this year. That places them 22nd in college football. Bowling Green is 97th in the country in punt returns with 10. They've totaled 94 punt return yards and average 9.4 yards per return, which is 36th in D-1. They have returned 31 kicks for 621 yards on special teams, which puts them 37th in kick return yardage. The Falcons average 20 yards per kick return and they are 81st in the nation in all-purpose yards with 4,128. The Bowling Green Falcons have tried 18 field goals this year and made 16, which is 8th in college football. Their kickers have a field goal percentage of 89%. Bowling Green Falcons kickers have made 95% of their extra points, going 20 for 21 this season. Their punters have accumulated 2,094 yards on 47 punts, averaging 45 yards per punt. That ranks them 13th in the NCAA in punting average. The Bulls have run for 1,246 yards as a team, which ranks 93rd in college football. They've run 323 times, averaging 3.9 yards per carry as a rushing unit. The Buffalo Bulls have been penalized on offense 52 times for 460 yards so far this season, which has them 77th in the country in penalties. They are 78th in the nation in points scored with 233. They have run 628 plays this season for 3,686 yards, which ranks them 32nd in Division 1 in total offense. Buffalo averages 5.9 yards per play, which is 49th in college football. As a team they have accumulated a total of 183 1st downs this year, placing them 72nd overall as an offensive unit. Tyree Jackson averages 7.4 yards per pass attempt and 7.2 adjusted yards per throw. He has completed 85 passes on 142 attempts for a completion percentage of 59.9%. His quarterback rating this year is 125.9. He has thrown for 1,046 yards this season. The Buffalo Bulls rush defense has allowed 424 attempts for 1,890 yards this year, putting them in 113th place in D-1 against the run. Buffalo has committed 56 penalties for 549 yards on the defensive side of the ball this season. That ranks them 87th in college football. They are 50th in the nation in points allowed on defense with 222. They have surrendered a total of 3,628 yards on D, which is 73rd in the country. The Bulls are ranked 55th in yards per play allowed with 5.5. Opposing offenses have completed 141 passes on 234 attempts against the Buffalo defense this season, placing them 22nd and 15th in Division 1. The Buffalo Bulls pass defense has also given up a total of 1,738 yards through the air, which is 36th overall in total pass defense. The Buffalo Bulls have attempted 18 field goals this season and made 11, which is 51st in D-1. Their kickers have a field goal percentage of 61%. Buffalo kickers have made 92% of their extra points, going 24 for 26 this year. Their punters have totaled 1,861 yards on 45 punts, averaging 41 yards per punt. That places them 77th in Division 1 in punting average. Buffalo is ranked 74th in the nation in punt returns with 12. They've accumulated 81 punt return yards and average 6.8 yards per return, which is 70th in college football. They have returned 24 kicks for 405 yards on special teams, ranking 103rd in kick return yardage. The Buffalo Bulls average 17 yards per kick return and they are 73rd in the country in all-purpose yards with 4,172.
Who will win tonight's Falcons/Bulls college football game against the spread?